Don’t just assume that a person with a disability can’t do a job because of this disability. In many cases slight modifications in job requirements, office setup, or other functionality allow a person to perform just as any other team member would. Don’t assume that all people with disabilities can do all jobs: However, there may be some instances when a disability does prevent a person from doing a certain job. Be sensitive to this and get clarification before you put someone in a role that they’re not equipped to handle. Take the disability out of the equation for a minute: When you’re hiring, don’t let a person’s disabilities totally shape your opinion of them. If they have a good attitude, proper training, and the means to do the job to the fullest extent, it doesn’t matter if they have a disability. Evaluate them just as you would any other candidate. Don’t take it upon yourself to make medical judgments: During the interview process, it’s not up to you to make medical judgments or to inquire about a person’s disability. You’re simply there to evaluate whether the candidate can perform the designated tasks. Present them with the information they need to know about your business and the open position, then leave it up to a doctor and other care providers to determine whether that person’s disability allows for them to work safely in this environment. Don’t try to overcompensate: Some hiring managers want to be sure that a person with a disability feels comfortable when they come in for an interview, but they end up going overboard as they try to be welcoming. This can produce an uncomfortable situation. Remember that a person with a disability just wants to be treated like any other employee. There’s no need for special attention. Ensure that the recruitment and application processes are open and accessible to all: If you’re doing a job fair, for example, make sure that you’re advertising in numerous ways. If you’re only posting fliers, people who are visually impaired may not be able to find out about the event. If you’re only advertising on the radio, those who are hearing impaired will miss out on the opportunity. But spreading the message across numerous platforms makes your company more accessible to all people, regardless of disabilities. Also verify that your application process is manageable for people of varying abilities. Some business owners don’t even consider this until they learn that it’s a factor that stops certain applicants from submitting their materials. 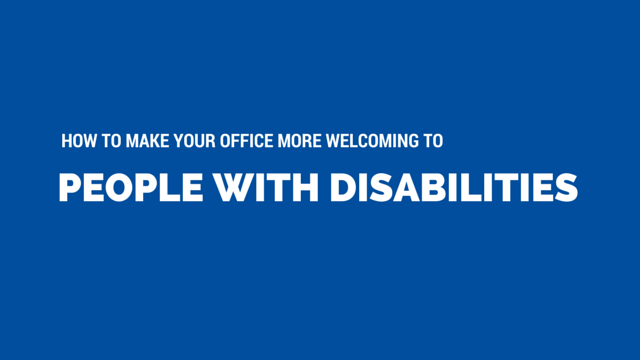 Lastly, verify that every aspect of your office is tailored for people with disabilities. This means entrances, bathrooms, water fountains, signs, emergency warning systems, and elevators. If you need extra guidance about this topic, check out the U.S. Access Board’s website.